"Family business destroyed twice by hurricanes and yet lives on"
The Moldaner family has been a fixture of the New Orleans' photographic industry for over 84 years. In the 1920's Edward H. Moldaner, Sr. worked as an employee at a local downtown camera shop. 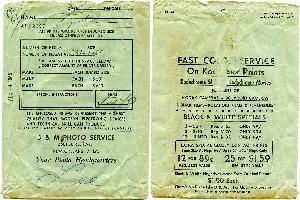 From the 1940's to the 1960's he owned and operated D & M Photo Service, a wholesale processing lab, until it was destroyed by Hurricane Betsy. 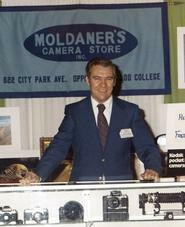 In the 1960's through the 1980's it was Edward H. Moldaner Jr.'s vision of Moldaner's Camera Store, a full-service retail camera store. Since that time, Robert Moldaner has steered the business through the perilous waters of in house photo labs, the digital transition and the devastation of Hurricane Katrina; to the resulting reincarnation of today's Moldaner's Camera and Imaging center Uptown on Maple Street. Over the years, the one constant in this journey has been our unwavering commitment to always putting our customers first. Today, Moldaner's survives as a testament to the inner strength and perserverence of the Moldaner family, and the city of New Orleans. Our story is a unique one, and deserves to be told. In 1925, when a then sixteen year old Eddie Moldaner walked into a downtown camera shop looking for a job, little did he know it was the beginning of a legacy that would span 91 years and three generations. From stock and errand boy, to photo lab technician, to wholesale lab owner, it would be a journey of a lifetime. For the next eighteen years, he worked there, first in the stockroom, then eventually in the lab. In 1931, he met and married Lee Collignon, my grandmother, whom provided much of the information here. In 1932, my father, Eddie, Jr, was born. This was the beginning of the depression years, and times were tough. There were times when Eddie Sr., was working so many hours he used to sleep on a cot in a back room, instead of going home. Sometimes, my grandmother would have to bring my father downtown so he could see his dad. In those eighteen years, my grandfather worked six days a week, never had a vacation, and was only given one half day off, when my father was born. He finally decided he could do better. In 1943, during World War II, Eddie Sr. decided it was time to strike out on his own. Along with a partner whom also worked at the lab, they decided to open their own wholesale film processing lab. They bought some land and built a lab at 2601 St. Roch Ave., in the Gentilly area. It was named D & M Photo Service, after the two owners, Paul Durand and Eddie Moldaner. During those early days, there was not enough business to support two families, so the partners would take turns running the lab, while the other one worked at the local shipyard. Eventually, the business grew to servicing over 200 neighborhood drugstores and businesses, supplying them with film, flashbulbs and photo processing. They would travel from New Orleans to Chalmette and to the Westbank on delivery routes every morning to drop off the day's processing and bring back new film. Then, they would spend the afternoon and into the evening developing and printing for the next day. If your family had film developed at one of the local drugstores during the 40's and 50's most likely we processed it. Then, in 1965, Hurricane Betsy came, and everything the family had built in the last 22 years was gone in nine feet of Gentilly floodwaters. At that time, there were no levees in that area of New Orleans, and there was no such thing as flood insurance. Eddie Sr. had passed away several years prior and fortunately didn't see his dream destroyed. But Eddie Jr. wasn't going to give up so easily. Moldaner's Camera on City Park Ave.
After the storm, Eddie was left with no job, and a wife at home with three small children. He supported the family for a year by selling coins to collectors. He would sit at the kitchen table at night and sort out nickels and dimes by year and mint, and go to shows on weekends. During the daytime, he started to reestablish the film processing connections with the local drugstores, operating out of a one room office Uptown on Calhoun St. But Eddie had a vision. He had always wanted to open a true camera store, much like the one his father worked at so many years before, and he saw this as his opportunity. So off he went looking for a place to start his business, which he originally named Moldaner's Photo Service. In 1966, he located a little building on City Park Avenue in Mid-City, across from Delgado College, and opened the doors for business. Was this the right location? The local mailman told Eddie there had been three different businesses there in the last two years, including a florist and an air conditioning repair company, and both had failed. Would this time be different? Well, Eddie made the right choice. The 1970's and 80's were a boom time for the photographic industry. Color film was all the rage, and cameras were becoming easier and more affordable. No longer was photography just for the professsionals, it was for everyone. And Moldaner's grew. From that one small 600sq ft storefront, Moldaner's eventually occupied the entire 3000sq ft building. I will be continuing this story in the near future. Please check back soon.